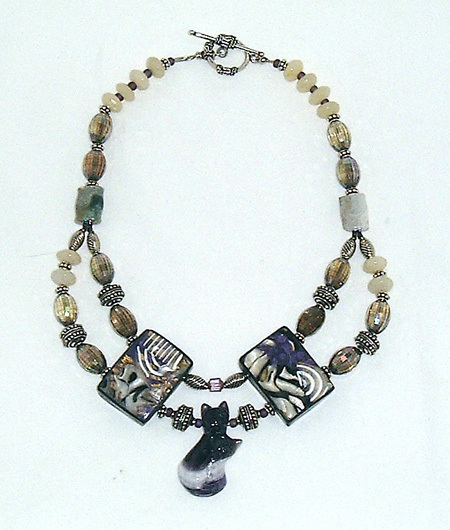 This unusual cat themed necklace designed by Mary features a carved amethyst cat and kitten centerpiece, Bali sterling silver, cut crystal, white jade and ocean jasper beads. The two large square accent beads are hand made, polymer clay art beads by master artist Pam Wynn. Colors are off-white, purple/amethyst, black, and gray. Necklace length is 16 inches, cat pendant is 1 1/2 inches long.